Hello, friends and Happy Holidays to you all. Seriously, I cannot believe it is the last week of 2016! I hope you had a blessed Christmas and can look forward to the New year. 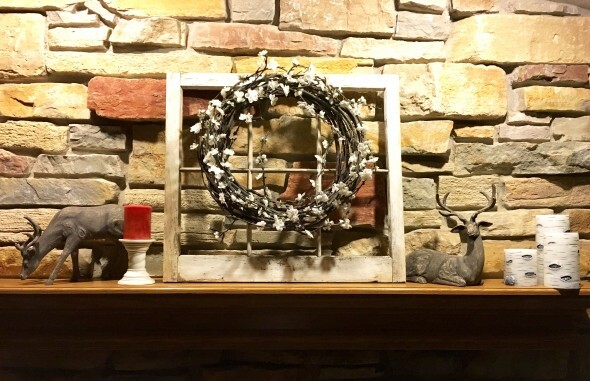 This Easy Thrifty Winter Mantle post was completed in January as a result of the all the Christmas decorations coming down and being packed away. This blog post also shows how easy it is to transition from a Christmas decorated mantle to a mantle that can be left for the remaining of the winter. See here, how I used items already owned to make the transition. As the winter cold dragged on, I continued to decorate around the house. Using thrifty finds are important to me in creating a warm, lived in home. 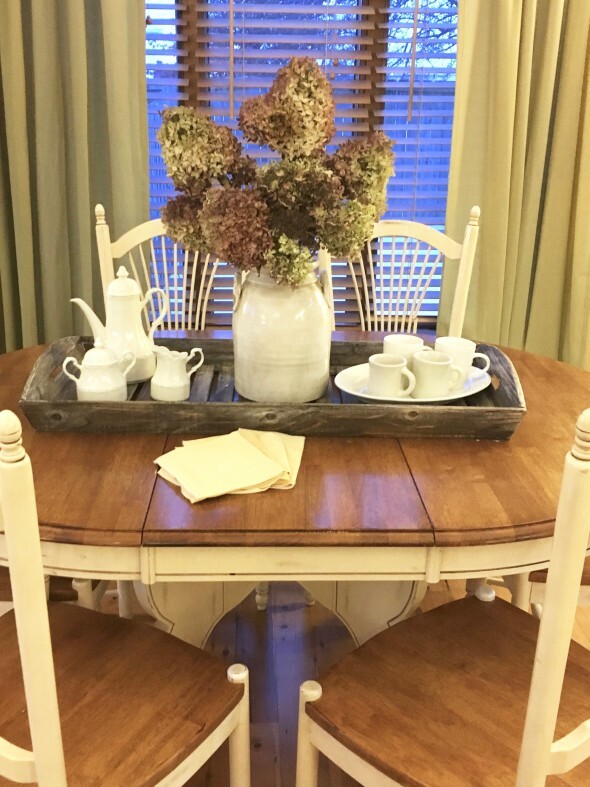 Here, Thrifty Winter Decorating with Ironstone, combined ironstone that I found at a church sale with some I already owned to create a winter table scape. 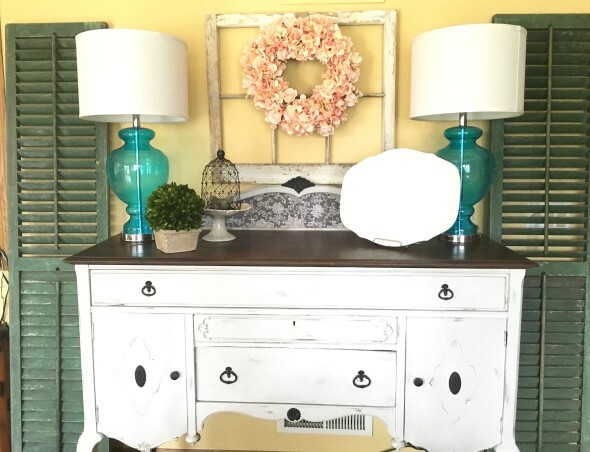 In this post, a quaint and simple vignette was created using items found at a garage sale and a flea market. Combining them together resulted in an outdoor decor scape that could last throughout the month. Knowing me, it probably stayed the entire month. You can read the complete post here. This post share was the easiest project to do. With a few items from around the house, some stain and spray paint, an adorable kitchen decoration was completed. Step by step directions are provided. You will just fall in love with the end result. Those “EAT” cutting boards are fabulous. Thanks for sharing with us at Funtastic Friday! All of them make great use of thrifty finds…my home is decorated using thrifty finds. Your sideboard is gorgeous I regret I changed my out? Great decorating such as yours truly shine with thrifting treasures. Thanks for stopping by! Thanks for the kind comments. Don’t regret changing something out. That’s the fun part! So happy you left a way to see your blog on my blog. Now I can see our post. Thanks for coming by and saying hello. Good to find your blog too. I love the simplicity and thriftyness! Thank you for sharing at Dishing It & Digging It. I look forward to seeing more of your creativity this year! They are all beautiful and I love them all. The winter mantle might be my fav. You are so talented with home decor. I always enjoy seeing your designs and creations. So glad you shared with us at Merry Monday. Pinning. Happy New Year! You always have some great decor tips! 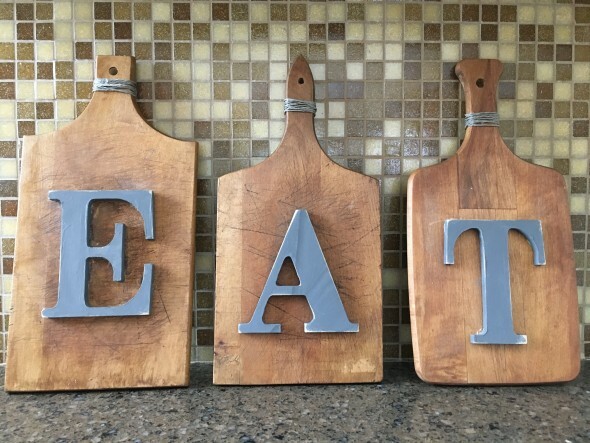 I really love the EAT sign and I think it would look great in any kitchen. I remember the winter mantel you shared and it’s always good to revisit popular posts for more inspiration. I remember all of these wonderful posts. I can’t pick a favorite because I love them all. The spring decorating photo is gorgeous. I do love no cost decorating. I always learn something from every one of your posts. Happy New Year! That sideboard is gorgeous and I love the “EAT” made from breadboards! 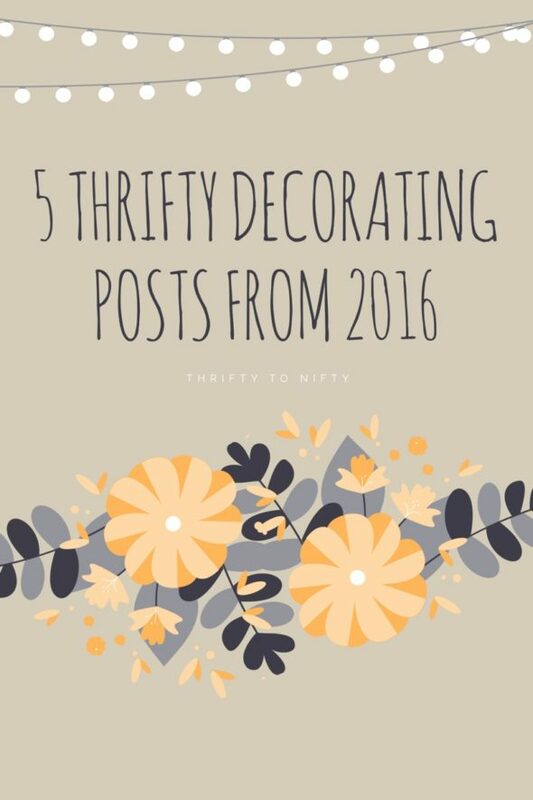 Here’s to all the amazing thrifty treasures that await us in 2017! Thanks for taking a peek, Christy. Hope you have a wonderful treasure shopping year! !